For the aircraft shot down over Ukraine in July 2014, see Malaysia Airlines Flight 17. Malaysia Airlines Flight 370 (also referred to as MH370 or MAS370)[a] was a scheduled international passenger flight operated by Malaysia Airlines that disappeared on 8 March 2014 while flying from Kuala Lumpur International Airport to its destination, Beijing Capital International Airport. The crew of the Boeing 777-200ER aircraft last communicated with air traffic control (ATC) around 38 minutes after takeoff when the flight was over the South China Sea. The aircraft was lost from ATC radar screens minutes later, but was tracked by military radar for another hour, deviating westwards from its planned flight path, crossing the Malay Peninsula and Andaman Sea. It left radar range 200 nautical miles (370 km) northwest of Penang Island in northwestern Malaysia. With all 227 passengers and 12 crew aboard presumed dead, the disappearance of Flight 370 was the deadliest incident involving a Boeing 777 and the deadliest in Malaysia Airlines' history, until it was surpassed in both regards by Malaysia Airlines Flight 17 that was shot down while flying over eastern Ukraine, four months later. The combined loss caused significant financial problems for Malaysia Airlines, which was renationalised by the Malaysian government in December 2014. The search for the missing airplane, which became the most costly in aviation history, focused initially on the South China and Andaman seas, before analysis of the aircraft's automated communications with an Inmarsat satellite identified a possible crash site somewhere in the southern Indian Ocean. The lack of official information in the days immediately after the disappearance prompted fierce criticism from the Chinese public, particularly from relatives of the passengers; most people on board Flight 370 were of Chinese origin. Several pieces of marine debris confirmed to be from the aircraft washed ashore in the western Indian Ocean during 2015 and 2016. After a three-year search across 120,000 square kilometres (46,000 sq mi) of ocean failed to locate the aircraft, the Joint Agency Coordination Centre heading the operation suspended their activities in January 2017. A second search launched in January 2018 by the private contractor Ocean Infinity also ended without success after six months. The disappearance of Flight 370 has been dubbed one of the greatest aviation mysteries of all time. Relying mostly on analysis of data from the Inmarsat satellite with which the aircraft last communicated, the Australian Transport Safety Bureau proposed initially that a hypoxia event was the most likely cause given the available evidence, although there has not been any consensus concerning this theory among investigators. At various stages of the investigation, possible hijacking scenarios were considered, including crew involvement, and suspicion of the airplane's cargo manifest; many unofficial theories have also been proposed by the media. The Malaysian Ministry of Transport's final report from July 2018 was inconclusive, but highlighted Malaysian air traffic controllers' failures to attempt to communicate with the aircraft shortly after its disappearance. In the absence of a definitive cause of the disappearance, safety recommendations and regulations of the air transport industry, citing Flight 370, have been intended mostly to prevent a repetition of the circumstances associated with the loss. These include increased battery life on underwater locator beacons, lengthening of recording times on flight data recorders and cockpit voice recorders, and new standards for aircraft position reporting over open ocean. The aircraft, a Boeing 777-200ER operated by Malaysia Airlines, last made voice contact with air traffic control at 01:19 MYT, 8 March (17:19 UTC, 7 March) when it was over the South China Sea, less than an hour after takeoff. It disappeared from air traffic controllers' radar screens at 01:22 MYT, but was still tracked on military radar as it deviated westwards from its planned flight path and crossed the Malay Peninsula, until it left the range of the military radar at 02:22 while over the Andaman Sea, 200 nautical miles (370 km) northwest of the island of Penang in northwestern Malaysia. The multinational search effort for the aircraft—which was to become the most expensive aviation search in history—began in the Gulf of Thailand and the South China Sea, where the aircraft's signal was last detected on secondary surveillance radar, and was soon extended to the Strait of Malacca and Andaman Sea. Analysis of satellite communications between the aircraft and Inmarsat's satellite communications network concluded that the flight continued until at least 08:19 and flew south into the southern Indian Ocean, although the precise location cannot be determined. 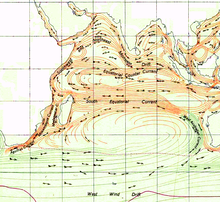 Australia assumed charge of the search on 17 March, when the search effort began to emphasize the southern Indian Ocean. On 24 March, the Malaysian government noted that the final location determined by the satellite communication was far from any possible landing sites, and concluded that "Flight MH370 ended in the southern Indian Ocean." From October 2014 to January 2017, a comprehensive survey of 120,000 km2 (46,000 sq mi) of sea floor about 1,800 km (1,100 mi) southwest of Perth, Western Australia, yielded no evidence of the aircraft. Several pieces of marine debris found on the coast of Africa and on Indian Ocean islands off the coast of Africa—the first discovered on 29 July 2015 on Réunion—have all been confirmed as pieces of Flight 370. The bulk of the aircraft has not been located, prompting many theories about its disappearance. On 22 January 2018, a search by private US marine exploration company Ocean Infinity began in the search zone around 35°36′S 92°48′E﻿ / ﻿35.6°S 92.8°E﻿ / -35.6; 92.8﻿ (CSIRO crash area), the most likely crash site according to the drift study published in 2017. In a previous search attempt, Malaysia had established the Joint Investigation Team (JIT) to investigate the incident, working with foreign aviation authorities and experts. Malaysia released a final report concerning Flight 370 in October 2017. Neither the crew nor the aircraft's communication systems relayed a distress signal, indications of bad weather, or technical problems before the aircraft vanished. Two passengers travelling on stolen passports were investigated, but eliminated as suspects. Malaysian police identified the captain as the prime suspect if human intervention was the cause of the disappearance, after clearing all others on the flight of suspicion over possible motives. Power was lost to the aircraft's satellite data unit (SDU) at some point between 01:07 and 02:03; the SDU logged onto Inmarsat's satellite communication network at 02:25, which was three minutes after the aircraft had left the range of radar. Based on analysis of the satellite communications, the aircraft turned south after passing north of Sumatra and the flight continued for six hours with little deviation in its track, ending when its fuel was exhausted. With the loss of all 239 aboard, Flight 370 is the second-deadliest incident involving a Boeing 777 and the second-deadliest incident of Malaysia Airlines' history, second to Flight 17 in both categories. Malaysia Airlines was struggling financially, a problem that was exacerbated by a decrease of ticket sales after the disappearance of Flight 370 and the downing of Flight 17; the airline was re-nationalised by the end of 2014. The Malaysian government received significant criticism, especially from China, for failing to disclose information promptly during the early weeks of the search. Flight 370's disappearance brought to public attention the limits of aircraft tracking and flight recorders, including the limited battery life of Underwater Locator Beacons (an issue that had been raised about four years earlier following the loss of Air France Flight 447, but had never been resolved). In response to Flight 370's disappearance, the International Civil Aviation Organization (ICAO) adopted new standards for aircraft position reporting over open ocean, extended recording time for cockpit voice recorders, and, starting from 2020, new aircraft designs will be required to have a means of recovering the flight recorders, or the information they contain, before they sink into the water. The Boeing 777 was introduced in 1994 and has an excellent safety record. [better source needed] Since its first commercial flight in June 1995, the type has suffered only five other hull losses: British Airways Flight 38 in 2008; a cockpit fire in a parked EgyptAir Flight 667 at Cairo International Airport in 2011; the crash of Asiana Airlines Flight 214 in 2013, in which three people died; Malaysia Airlines Flight 17, which was shot down over Ukraine killing all 298 people aboard in July 2014; and in August 2016, the sixth Boeing 777 hull-loss occurred, when Emirates Flight 521 crashed while landing at Dubai International Airport and began burning. The aircraft was carrying 12 Malaysian crew members and 227 passengers from 14 different nations. On the day of the disappearance, Malaysia Airlines released the names and nationalities of the passengers and crew, based on the flight manifest. The passenger list was later modified to include two Iranian passengers travelling on stolen passports. All twelve crew members—two pilots and ten cabin staff—were Malaysian citizens. Of the 227 passengers, 153 were Chinese citizens, including a group of 19 artists with six family members and four staff returning from a calligraphy exhibition of their work in Kuala Lumpur; 38 passengers were Malaysian. The remaining passengers were from twelve different countries. Twenty passengers—twelve of whom were from Malaysia and eight from China—were employees of Freescale Semiconductor. Through a 2007 agreement with Malaysia Airlines, Tzu Chi (an international Buddhist organisation) immediately sent specially trained teams to Beijing and Malaysia to give emotional assistance to passengers' families. The airline also sent its own team of caregivers and volunteers and agreed to bear the expense of bringing family members of the passengers to Kuala Lumpur and providing them with accommodation, medical care, and counselling. Altogether, 115 family members of the Chinese passengers flew to Kuala Lumpur. Some other family members chose to remain in China, fearing they would feel too isolated in Malaysia. ATC conversations with Flight 370 Audio recordings of conversations between ATC and Flight 370 from pre-departure to final contact (00:25–01:19). Lumpur Radar: "Malaysian three seven zero, contact Ho Chi Minh one two zero decimal nine. Good night." Flight 370: "Good night. Malaysian three seven zero." Data from Malaysian military radar showing Flight 370 (green) crossing the Strait of Malacca and Andaman Sea to where it was last detected by radar. The left of the two segments of the flight track follows air route N571 between waypoints VAMPI and MEKAR; the white circle appears to highlight a section where the aircraft was not tracked by radar. 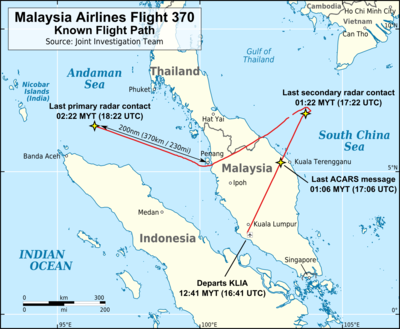 At the time that the transponder stopped functioning, military radar showed Flight 370 turning right, but then beginning a left turn to a southwesterly direction. :3 From 01:30:35 until 01:35, military radar showed Flight 370 at 35,700 ft (10,900 m)[h] on a 231° magnetic heading, with a ground speed of 496 knots (919 km/h; 571 mph). Flight 370 continued across the Malay Peninsula, fluctuating between 31,000 and 33,000 ft (9,400 and 10,100 m) in altitude. :3 A civilian primary radar at Sultan Ismail Petra Airport with a 60 nmi (110 km; 69 mi) range made four detections of an unidentified aircraft between 01:30:37 and 01:52:35; the tracks of the unidentified aircraft are "consistent with those of the military data". [i]:3–4 At 01:52, Flight 370 was detected passing just south of the island of Penang. From there, the aircraft flew across the Strait of Malacca, passing close to the waypoint VAMPI, and Pulau Perak at 02:03, after which it flew along air route N571 to waypoints MEKAR, NILAM, and possibly IGOGU. :3, 38 The last known radar detection, from a point near the limits of Malaysian military radar, was at 02:22, 10 nmi (19 km; 12 mi) after passing waypoint MEKAR:3, 7 (which is 237 nmi (439 km; 273 mi) from Penang) and 247.3 nmi (458.0 km; 284.6 mi) northwest of Penang airport at an altitude of 29,500 ft (9,000 m). Countries were reluctant to release information collected from military radar because of sensitivity about revealing their capabilities. Indonesia has an early-warning radar system, but its air traffic control radar did not register any aircraft with the transponder code used by Flight 370, despite the aircraft possibly having flown near, or over, the northern tip of Sumatra. :4 Indonesian military radar tracked Flight 370 earlier when en route to waypoint IGARI before the transponder is thought to have been turned off, but did not provide information on whether it was detected afterwards. :4 Thailand and Vietnam also detected Flight 370 on radar before the transponder stopped working. The radar position symbols for the transponder code used by Flight 370 vanished after the transponder is thought to have been turned off. :4–5 Vietnam deputy minister of transport Pham Quy Tieu stated that Vietnam noticed MH370 turn back towards the west and Vietnam operators had informed Malaysian authorities twice the same day, 8th of March. Thai military radar detected an aircraft that might have been Flight 370, but it is not known what time the last radar contact was made, and the signal did not include identifying data. Also, the flight was not detected by Australia's conventional system or its long-range JORN over-the-horizon radar system (which has an official range of 3,000 km); the latter was not in operation on the night of the disappearance. At 02:25 MYT, the aircraft's satellite communication system sent a "log-on request" message—the first message since the ACARS transmission at 01:07—which was relayed by satellite to a ground station, both operated by satellite telecommunications company Inmarsat. After logging on to the network, the satellite data unit aboard the aircraft responded to hourly status requests from Inmarsat and two ground-to-aircraft telephone calls, at 02:39 and 07:13, which were unanswered by the cockpit. :18 The final status request and aircraft acknowledgement occurred at 08:10, about 1 hour and 40 minutes after it was scheduled to arrive in Beijing. The aircraft sent a log-on request at 08:19:29, which was followed, after a response from the ground station, by a "log-on acknowledgement" message at 08:19:37. The log-on acknowledgement is the last piece of data available from Flight 370. The aircraft did not respond to a status request from Inmarsat at 09:15. 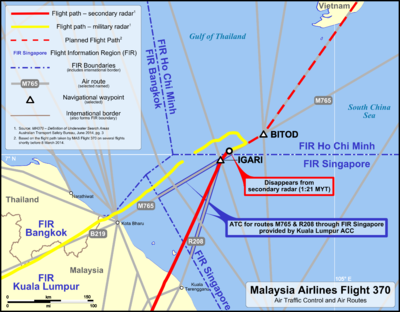 At 01:38 MYT, Ho Chi Minh Area Control Centre (ACC) contacted Kuala Lumpur Area Control Centre to query the whereabouts of Flight 370 and informed them that they had not established verbal communication with Flight 370, which was last detected by radar at waypoint BITOD. The two centres exchanged four more calls during the next 20 minutes with no new information. At 02:03, Kuala Lumpur ACC relayed to Ho Chi Minh ACC information received from Malaysia Airlines' operations centre that Flight 370 was in Cambodian airspace. Ho Chi Minh ACC contacted Kuala Lumpur ACC twice in the following eight minutes asking for confirmation that Flight 370 was in Cambodian airspace. At 02:15, the watch supervisor at Kuala Lumpur ACC queried Malaysia Airlines' operations centre, which said that it could exchange signals with Flight 370 and that Flight 370 was in Cambodian airspace. Kuala Lumpur ACC contacted Ho Chi Minh ACC to ask whether the planned flight path for Flight 370 passed through Cambodian airspace. Ho Chi Minh ACC responded that Flight 370 was not supposed to enter Cambodian airspace and that they had already contacted Phnom Penh ACC (which controls Cambodian airspace), which had no communication with Flight 370. Kuala Lumpur ACC contacted Malaysia Airlines' operations centre at 02:34, inquiring about the communication status with Flight 370, and were informed that Flight 370 was in a normal condition based on a signal download and that it was located at 14°54′N 109°15′E﻿ / ﻿14.900°N 109.250°E﻿ / 14.900; 109.250. Later, another Malaysia Airlines aircraft (Flight 386 bound for Shanghai) attempted, at the request of Ho Chi Minh ACC, to contact Flight 370 on the Lumpur Radar frequency – the frequency on which Flight 370 last made contact with Malaysian air traffic control – and on emergency frequencies. The attempt was unsuccessful. At 03:30, Malaysia Airlines' operations centre informed Kuala Lumpur ACC that the locations it had provided earlier were "based on flight projection and not reliable for aircraft positioning." Over the next hour, Kuala Lumpur ACC contacted Ho Chi Minh ACC asking whether they had signalled Chinese air traffic control. At 05:09, Singapore ACC was queried for information about Flight 370. At 05:20, an undisclosed official contacted Kuala Lumpur ACC requesting information about Flight 370; he opined that, based on known information, "MH370 never left Malaysian airspace." The watch supervisor at Kuala Lumpur ACC activated the Kuala Lumpur Aeronautical Rescue Coordination Centre (ARCC) at 05:30, more than four hours after communication was lost with Flight 370. The ARCC is a command post at an Area Control Centre that coordinates search-and-rescue activities when an aircraft is lost. Malaysia Airlines issued a media statement at 07:24 MYT, one hour after the scheduled arrival time of the flight at Beijing, stating that communication with the flight had been lost by Malaysian ATC at 02:40 and that the government had initiated search-and-rescue operations; the time when contact was lost was later corrected to 01:21. Neither the crew nor the aircraft's communication systems relayed a distress signal, indications of bad weather, or technical problems before the aircraft vanished from radar screens. On 24 March, Malaysian Prime Minister Najib Razak appeared before media at 22:00 local time to give a statement regarding Flight 370, during which he announced that he had been briefed by the Air Accidents Investigation Branch that it and Inmarsat (the satellite data provider) had concluded that the airliner's last position before it disappeared was in the southern Indian Ocean. As there were no places there where it could have landed, the aircraft must therefore have crashed into the sea. Just before Najib spoke at 22:00 MYT, an emergency meeting was called in Beijing for relatives of Flight 370 passengers. Malaysia Airlines announced that Flight 370 was assumed lost with no survivors. It notified most of the families in person or via telephone, and some received an SMS (in English and Chinese) informing them that it was likely that the aircraft had crashed with no survivors. On 29 January 2015, the Director General of the Department of Civil Aviation Malaysia, Azharuddin Abdul Rahman, announced that the status of Flight 370 would be changed to an "accident", in accordance with the Chicago Convention on International Civil Aviation, and that all passengers and crew are presumed to have lost their lives. If the official assumption is confirmed, Flight 370 was at the time of its disappearance the deadliest aviation incident in the history of Malaysian Airlines, surpassing the 1977 hijacking and crash of Malaysian Airline System Flight 653 that killed all 100 passengers and crew aboard, and the deadliest involving a Boeing 777, surpassing Asiana Airlines Flight 214 (3 fatalities). In both of those categories, Flight 370 was surpassed 131 days later by Malaysia Airlines Flight 17, another Boeing 777-200ER, which was shot down on 17 July 2014, killing all 298 people aboard. The news media reported several sightings of an aircraft fitting the description of the missing Boeing 777. For example, on 19 March 2014, CNN reported that witnesses including fishermen, an oil rig worker and people on the Kuda Huvadhoo atoll in the Maldives saw the missing airliner. A fisherman claimed to have seen an unusually low-flying aircraft off the coast of Kota Bharu; while an oil-rig worker 186 miles (299 km) southeast of Vung Tau claimed he saw a "burning object" in the sky that morning, a claim credible enough for the Vietnamese authorities to send a search-and-rescue mission; and Indonesian fishermen reported witnessing an aircraft crash near the Malacca Straits. Two days later, the London-based Daily Mail reported that "a Malaysian woman on a flight across the Indian Ocean claimed to have seen an aircraft in the water near the Andaman Islands on the day the jet disappeared". Three months later, The Daily Telegraph reported that a British woman sailing in the Indian Ocean claimed to have seen an aircraft afire. A search-and-rescue effort was launched in southeast Asia soon after the disappearance of Flight 370. Following the initial analysis of communications between the aircraft and a satellite, the surface search was moved to the southern Indian Ocean one week after the aircraft's disappearance. Between 18 March and 28 April, nineteen vessels and 345 sorties by military aircraft searched over 4,600,000 km2 (1,800,000 sq mi). The final phase of the search was a bathymetric survey and sonar search of the sea floor, about 1,800 kilometres (970 nmi; 1,100 mi) southwest of Perth, Western Australia. With effect from 30 March 2014, the search was coordinated by the Joint Agency Coordination Centre (JACC), an Australian government agency that was established specifically to co-ordinate the search effort to locate and recover Flight 370, which primarily involved the Malaysian, Chinese, and Australian governments. On 17 January 2017, the official search for Flight 370—which had proved to be the most expensive search operation in aviation history—was suspended after yielding no evidence of the aircraft other than some marine debris on the coast of Africa. The final ATSB report, published on 3 October 2017, stated that the underwater search for the aircraft, as of 30 June 2017[update], had cost a total of US$155 million: the underwater search accounted for 86% of this amount, bathymetry 10%, and programme management 4%; Malaysia had supported 58% of the total cost, Australia 32%, and China 10%. The report also concluded that the location where the aircraft went down had been narrowed to an area of 25,000 km2 (9,700 sq mi), by using satellite images and debris drift analysis. In January 2018, a private US marine exploration company called Ocean Infinity resumed the search for MH370 in the narrowed 25,000 km2 area, using the Norwegian ship Seabed Constructor. The search area was significantly extended during the course of the search, and by the end of May 2018, the vessel had searched a total area of over 112,000 km2 (43,000 sq mi), using eight autonomous underwater vehicles (AUVs). The contract with the Malaysian government ended soon afterward, and the search was concluded without success on 9 June 2018. The Kuala Lumpur Aeronautical Rescue Coordination Centre (ARCC) was activated at 05:30 MYT—four hours after communication was lost with the aircraft—to co-ordinate search and rescue efforts. Search efforts began in the Gulf of Thailand and South China Sea. On the second day of the search, Malaysian officials said that radar recordings indicated that Flight 370 may have turned around before vanishing from radar screens; the search zone was expanded to include part of the Strait of Malacca. 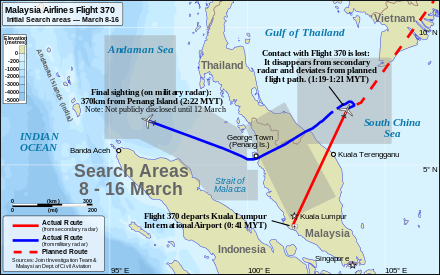 On 12 March, the chief of the Royal Malaysian Air Force announced that an unidentified aircraft—believed to be Flight 370—had travelled across the Malay peninsula and was last sighted on military radar 370 km (200 nmi; 230 mi) northwest of the island of Penang; search efforts were subsequently increased in the Andaman Sea and Bay of Bengal. Records of signals sent between the aircraft and a communications satellite over the Indian Ocean revealed that the aircraft had continued flying for almost six hours after its final sighting on Malaysian military radar. 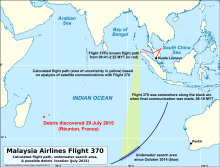 Initial analysis of these communications determined that Flight 370 was along one of two arcs—equidistant from the satellite—when its last signal was sent; the same day this analysis was disclosed publicly, 15 March, authorities announced they would abandon search efforts in the South China Sea, Gulf of Thailand, and Strait of Malacca to emphasize their efforts on the two corridors. The northern arc—from northern Thailand to Kazakhstan—was soon discounted, for the aircraft would have had to pass through heavily militarised airspace and those countries claimed their military radar would have detected an unidentified aircraft entering their airspace. 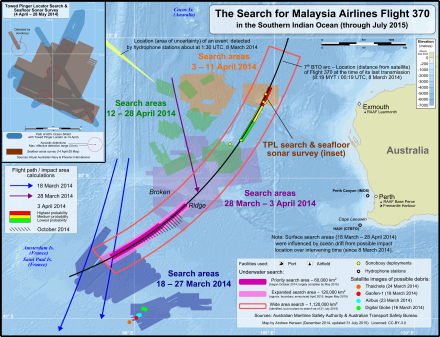 The shifting search zones for Flight 370 in the Southern Indian Ocean. The inset shows the path taken by the vessel ADV Ocean Shield operating a towed pinger locator, acoustic detections, and the sonar search. The underwater phase (both the wide area search and priority area) is shown in pink. The emphasis of the search was shifted to the Southern Indian Ocean west of Australia and within Australia's aeronautical and maritime Search and Rescue regions that extend to 75°E longitude. Accordingly, on 17 March, Australia agreed to manage the search in the southern locus from Sumatra to the southern Indian Ocean. From 18–27 March 2014 the search effort focused on a 305,000 km2 (118,000 sq mi) area about 2,600 km (1,400 nmi; 1,600 mi) southwest of Perth, that Australian Prime Minister Tony Abbott said is "as close to nowhere as it's possible to be" and which is renowned for its strong winds, inhospitable climate, hostile seas, and deep ocean floors. Satellite imagery of the region was analysed; several objects of interest and two possible debris fields were identified on images made between 16–26 March. None of these possible objects were found by aircraft or ships. Revised estimates of the radar track and the aircraft's remaining fuel led to a move of the search 1,100 km (590 nmi; 680 mi) northeast of the previous area on 28 March, which was followed by another shift on 4 April. Between 2 and 17 April an effort was made to detect the underwater locator beacons (ULBs; informally known as "pingers") attached to the aircraft's flight recorders, whose batteries were expected to expire around 7 April. Australian naval cutter ADV Ocean Shield equipped with a towed pinger locator (TPL); China's Haixun 01 equipped with a hand-held hydrophone; and the Royal Navy's HMS Echo equipped with a hull-mounted hydrophone; were utilised in the search. :11–12:36 Operators considered it a shot in the dark, when comparing the vast search area with the fact that a TPL could only search up to 130 km2 (50 sq mi) per day. Between 4–8 April several acoustic detections were made that were close to the frequency and rhythm of the sound emitted by the flight recorders' ULBs; analysis of the acoustic detections determined that, although unlikely, the detections could have come from a damaged ULB. :13 A sonar search of the sea-floor near the detections was carried out between 14 April and 28 May without any sign of Flight 370.:14 In a March 2015 report, it was revealed that the calendar life of the battery for the ULB attached to Flight 370's flight data recorder had expired in December 2012 and may not have been as capable. In late June 2014, details of the next phase of the search were announced; officials have called this phase the "underwater search", despite the previous seafloor sonar survey. Continued refinement of the analysis of Flight 370's satellite communications identified a "wide area search" along the arc where Flight 370 was located when it last communicated with the satellite. The priority search area was in the southern extent of the wide area search. Some of the equipment used for the underwater search is known to be most effective when towed 200 m (650 ft) above the seafloor at the end of a 9.7 km (6 mi) cable. Available bathymetric data for this region was of poor resolution, thus necessitating a bathymetric survey of the search area before the underwater phase began. Commencing in May, the bathymetric survey charted around 208,000 km2 (80,000 sq mi) of seafloor through 17 December 2014, when it was suspended so that the ship conducting the survey could be mobilised in the underwater search. The governments of Malaysia, China, and Australia agreed to thoroughly search 120,000 km2 (46,000 sq mi) of seafloor. This phase of the search, which began on 6 October 2014, used three vessels equipped with towed deep-water vehicles that use side-scan sonar, multi-beam echo sounders, and video cameras to locate and identify aircraft debris. A fourth vessel participated in the search between January–May 2015, using an AUV to search areas that could not be effectively searched using equipment on the other vessels. Following the discovery of the flaperon on Réunion, the Australian Transport Safety Bureau (ATSB) reviewed its drift calculations for debris from the aircraft and, according to the JACC, was satisfied that the search area was still the most likely crash site. Reverse drift modelling of the debris, to determine its origin after 16 months, also supported the underwater search area, although reverse drift modelling is very imprecise over long periods. On 17 January 2017, the three countries jointly announced the suspension of the search for Flight 370. On 17 October 2017, Malaysia received proposals from three companies, including Dutch-based Fugro, and US company Ocean Infinity, offering to continue the search for the aircraft. In January 2018, Ocean Infinity announced that it was planning to resume the search in the narrowed 25,000 km2 (9,700 sq mi) area. The search attempt was approved by the Malaysian government, provided that payment would only be made if the wreckage were found. Ocean Infinity chartered the Norwegian ship Seabed Constructor to perform the search. In late January, it was reported that the AIS tracking system had detected the vessel reaching the search zone on 21 January, and it started moving to 35°36′S 92°48′E﻿ / ﻿35.6°S 92.8°E﻿ / -35.6; 92.8﻿ (CSIRO crash area), the most likely crash site according to the drift study by the Commonwealth Scientific and Industrial Research Organisation (CSIRO). The planned search area of "site 1", where the search began, was 33,012 km2 (12,746 sq mi), while the extended search area covered a further 48,500 km2 (18,700 sq mi). 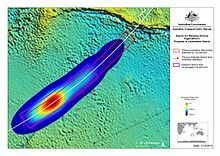 In April, a report by Ocean Infinity revealed that "site 4", further northeast along the 7th arc, had been added to the search plan. By the end of May 2018, the vessel had searched a total area of over 112,000 km2 (43,000 sq mi), using eight AUVs; all areas of "site 1" (including areas beyond that originally planned for "site 1"), "site 2", and "site 3" had been searched. The final phase of the search was conducted in "site 4" in May 2018, "before the weather limits Ocean Infinity's ability to continue working this year." Malaysia's new Transport Minister, Loke Siew Fook, announced on 23 May 2018 that the search for MH370 would conclude at the end of the month; Ocean Infinity confirmed on 31 May that their contract with the Malaysian government had ended, and it was reported on 9 June 2018 that the Ocean Infinity search had come to an end. Ocean floor mapping data collected during the search have been donated to the Nippon Foundation–GEBCO Seabed 2030 Project, to be incorporated into the global map of the ocean floor. In March 2019, in the wake of the 5th anniversary of the disappearance, the Malaysian government stated it was willing to look at any "credible leads or specific proposals" regarding a new search. Ocean Infinity stated they are ready to resume the search on the same no-fee no-find basis, believing they would benefit from the experience they gained from their search for the wreck of Argentinian submarine ARA San Juan and bulk carrier ship Stellar Daisy; the most probable location still being somewhere along the 7th arc around the area identified previously, the one which their 2018 search was based on. By October 2017, twenty pieces of debris believed to be from 9M-MRO had been recovered from beaches in the western Indian Ocean; eighteen of the items were "identified as being very likely or almost certain to originate from MH370", while the other two were "assessed as probably from the accident aircraft. ":106 On 16 August 2017, the ATSB released two reports: the analysis of satellite imagery collected on 23 March 2014, two weeks after MH370 disappeared, classifying twelve objects in the ocean as "probably man-made"; and a drift study of the recovered objects by the CSIRO, identifying the crash area "with unprecedented precision and certainty", at 35°36′S 92°48′E﻿ / ﻿35.6°S 92.8°E﻿ / -35.6; 92.8﻿ (CSIRO crash area), northeast of the main 120,000 km2 (46,000 sq mi) underwater search zone. The first item of debris to be positively identified as originating from Flight 370 was the starboard flaperon (a trailing edge control surface). It was discovered at the end of July 2015 on a beach in Saint-André, on Réunion, an island in the western Indian Ocean, about 4,000 km (2,200 nmi; 2,500 mi) west of the underwater search area. The item was transported from Réunion (an overseas department of France) to Toulouse, where it was examined by France's civil aviation accident investigation agency, the Bureau d'Enquêtes et d'Analyses pour la Sécurité de l'Aviation Civile (BEA), and a French defence ministry laboratory. Malaysia sent its own investigators to both Réunion and Toulouse. On 3 September, French officials announced that serial numbers found on internal components of the flaperon linked it "with certainty" to Flight 370. These serial numbers were retrieved using a borescope. After the discovery, French police conducted a search of the waters around Réunion for additional debris, and found a damaged suitcase that might be linked to Flight 370. [needs update] The location of the discovery was consistent with models of debris dispersal sixteen months after an origin in the current search area, off the west coast of Australia. A Chinese water bottle and an Indonesian cleaning product were also found in the same area. In August 2015, France carried out an aerial search for possible marine debris around the island, covering an area of 120 by 40 km (75 by 25 mi) along the east coast of Réunion. Foot patrols were also planned, to search for debris along the beaches. Malaysia asked authorities in neighbouring states to be on the alert for marine debris that might have come from an aircraft. On 14 August, it was announced that no debris that could be related to Flight 370 had been found at sea off Réunion, but that some items had been found on land. Air and sea searches for debris ended on 17 August. In late February 2016, an object (with a stencilled text "NO STEP" on it) was found off the coast of Mozambique; early photographic analysis suggested it could have come from the aircraft's horizontal stabiliser or the leading edges of the wings. It was found by Blaine Gibson on a sandbank in the Bazaruto Archipelago off the coast of Vilanculos in southern Mozambique; around 2000 km southwest of where the flaperon had been found the previous July. The fragment was sent to Australia where experts identified it as almost certainly a horizontal stabiliser panel from MH370. In December 2015, Liam Lotter found a grey piece of debris on a beach in southern Mozambique, but only after reading in March 2016 about Gibson's find—some 300 km (190 mi) from his find—did his family alert authorities. It was flown to Australia for analysis. It carried a stencilled code 676EB, which identified it as part of a Boeing 777 flap track fairing, and the style in which the lettering was painted onto the fairing matched stencils used by Malaysia Airlines, making it almost certain that the part came from 9M-MRO. The location where both pieces were retrieved was found to be consistent with the drift model performed by CSIRO, further corroborating they could have come from Flight 370. On 7 March 2016, more debris, possibly from the aircraft, was found on the island of Réunion. Ab Aziz Kaprawi, Malaysia's Deputy Transport Minister, said that "an unidentified grey item with a blue border", might be linked to Flight 370. Both Malaysian and Australian authorities, co-ordinating the search in the South Indian Ocean, sent teams to verify whether the debris was from the missing aircraft. On 21 March 2016, South African archaeologist Neels Kruger found a grey piece of debris on a beach near Mossel Bay, South Africa that has an unmistakable partial logo of Rolls-Royce, the manufacturer of the engines of the missing aircraft. An acknowledgement of a possible part of an engine cowling was made by the Malaysian Ministry of Transport. An additional piece of possible debris, suggested to have come from the interior of the aircraft, was found on the island of Rodrigues, Mauritius, in late March and was to be examined by Australian authorities. On 11 May 2016, the authority determined that these two pieces of debris were "almost certainly" from Flight 370. On 24 June 2016, the Australian Transport Minister, Darren Chester, said that a piece of aircraft debris had been found on Pemba Island, off the coast of Tanzania. It was handed over to the authorities so that experts from Malaysia could determine whether it was part of the aircraft. On 20 July, the Australian government released photographs of the piece, which was believed to be an outboard flap from one of the aircraft's wings. Malaysia's transport ministry confirmed on 15 September that the debris was indeed from the missing aircraft. On 21 November 2016, families of the victims announced that they would carry out a search for debris, during December, on the island of Madagascar. On 30 November 2018, five pieces of debris that had been recovered between December 2016 and August 2018 on the Madagascan coast, and believed by relatives of those on board to be from the doomed plane, were handed to Malaysian Transport Minister Anthony Loke. Malaysia quickly assembled a Joint Investigation Team (JIT), consisting of specialists from Malaysia, China, the United Kingdom, the United States, and France,:1 which was led in accordance with ICAO standards by "an independent investigator in charge". The team consisted of an airworthiness group, an operations group, and a medical and human factors group. The airworthiness group were tasked with examining issues relating to maintenance records, structures, and systems of the aircraft; the operations group were to review the flight recorders, operations, and meteorology; and the medical and human factors group would investigate psychological, pathological, and survival factors. Malaysia also announced, on 6 April 2014, that it had set up three ministerial committees: a Next of Kin Committee, a committee to organise the formation of the JIT, and a committee responsible for the Malaysian assets deployed in the search effort. The criminal investigation was led by the Royal Malaysia Police,:9 assisted by Interpol and other relevant international law enforcement authorities. As of October 2018[update], France was the only country that was continuing the investigation (by means of its Air Transport Gendarmerie), with the intention of verifying all of the technical data transmitted, particularly those provided by Inmarsat. On 8 March 2015, exactly one year after the disappearance of Flight 370, the Malaysian Ministry of Transport issued an interim report titled "Factual Information: Safety Information for MH370", which focused on providing factual information about the missing airplane, rather than the analysis of possible causes of the disappearance. A brief update statement was provided one year later, in March 2016, regarding the status of the investigation. The final ATSB report was published on 3 October 2017. The final report from the Malaysian Ministry of Transport, dated 2 July 2018, was released to the public in Kuala Lumpur on 30 July 2018. This report did not provide any new information concerning the fate of MH370, but it did indicate errors made by Malaysian air traffic controllers in their limited efforts to communicate with the aircraft. Following these accounts of air traffic control failings, the Chairman of the Civil Aviation Authority of Malaysia, Azharuddin Abdul Rahman, resigned on 31 July 2018. A depiction of an Inmarsat-3 series satellite. Flight 370 was in contact with Inmarsat-3 F1 (also known as "IOR" for Indian Ocean Region). Aeronautical satellite communication (SATCOM) systems are used to transmit messages sent from the aircraft cockpit, as well as automated data signals from onboard equipment, using the ACARS communications protocol. SATCOM may also be used for the transmission of FANS and ATN messages, and for providing voice, fax and data links using other protocols. The aircraft uses a satellite data unit (SDU) to send and receive signals over the satellite communications network; this operates independently from the other onboard systems that communicate via SATCOM, mostly using the ACARS protocol. Signals from the SDU are transmitted to a communications satellite, which amplifies the signal and changes its frequency before relaying it to a ground station, where the signal is processed and, if applicable, routed to its intended destination (e.g. Malaysia Airlines' operations centre); signals are sent from the ground to the aircraft in reverse order. When the SDU is first powered on, it attempts to connect with the Inmarsat network by transmitting a log-on request, which is acknowledged by the ground station. :17 This is partly to determine whether the SDU belongs to an active service subscriber, and also to identify which satellite should be used for transmitting messages to the SDU. After connecting, if no further contact has been received from the data terminal (the SDU) for one hour,[k] the ground station transmits a "log-on interrogation" message, commonly referred to as a "ping";:18 if the terminal is active, it will respond to the ping automatically. The entire process of interrogating the terminal is referred to as a "handshake". The aircraft did not respond to a ping at 09:15. Since the aircraft did not respond to a ping at 09:15, it can be concluded that at some point between 08:19 and 09:15, the aircraft lost the ability to communicate with the ground station. The log-on message sent from the aircraft at 08:19:29 was "log-on request"; there are only a few reasons the SDU would transmit this request, such as a power interruption, software failure, loss of critical systems providing input to the SDU, or a loss of the link due to the aircraft's attitude. :22 Investigators consider the most likely reason to be that it was sent during power-up after an electrical outage. The analysis of the flaperon showed that the landing flaps were not extended, supporting the spiral dive at high speed theory. In May 2018, the ATSB again asserted that the flight was not in control when it crashed, its spokesperson adding that "We have quite a bit of data to tell us that the aircraft, if it was being controlled at the end, it wasn't very successfully being controlled." This was in reaction to speculation by Canadian former air crash investigator Larry Vance in his book that the cause was pilot suicide. Two men boarded Flight 370 with stolen passports, which raised suspicion in the immediate aftermath of its disappearance. The passports, one Austrian and one Italian, had been reported stolen in Thailand within the preceding two years. Interpol stated that both passports were listed on its Stolen and Lost Travel Documents (SLTD) database, and that no check had been made against the database since the passports were first reported as stolen. Malaysia's Home Minister, Ahmad Zahid Hamidi, criticised his country's immigration officials for failing to stop the passengers travelling with the stolen European passports. The two one-way tickets purchased for the holders of these passports were booked through China Southern Airlines. It was reported that an Iranian had ordered the cheapest tickets to Europe via telephone in Bangkok, Thailand, and paid by cash. The two passengers were later identified as Iranian men, one aged 19 and the other 29, who had entered Malaysia on 28 February using valid Iranian passports. The two men were believed to be asylum seekers. The Secretary General of Interpol stated that the organisation was "inclined to conclude that it was not a terrorist incident". United States and Malaysian officials reviewed the backgrounds of every passenger named on the manifest. On 18 March, the Chinese government announced that it had checked all of the Chinese citizens on the aircraft and had ruled out the possibility that any were involved in "destruction or terror attacks". One passenger, who worked as a flight engineer for a Swiss jet charter company, was briefly under suspicion as a potential hijacker because he was thought to have the relevant "aviation skills". US officials believe the most likely explanation to be that someone in the cockpit of Flight 370 re-programmed the aircraft's autopilot to travel south across the Indian Ocean. Police searched the homes of the pilots and seized financial records for all twelve crew members, including bank statements, credit card bills and mortgage documents. On 2 April 2014, Malaysia's Police Inspector-General said that more than 170 interviews had been conducted as part of Malaysia's criminal investigation, including interviews with family members of the pilots and crew. In 2016, a leaked American document stated that a route on the pilot's home flight simulator, which closely matched the projected flight over the Indian Ocean, was found during the FBI analysis of the flight simulator's computer hard drive. This was later confirmed by the ATSB, although the agency stressed that this did not prove the pilot's involvement. The find was similarly confirmed by the Malaysian government. The lithium-ion batteries were contained in a 2,453 kg (5,408 lb) consignment being transported between Motorola Solutions facilities in Bayan Lepas, Malaysia, and Tianjin, China; the rest of the consignment consisted of walkie-talkie chargers and accessories. :103 The batteries were assembled on 7 March and transported to the Penang Cargo Complex to be transported by MASkargo—Malaysia Airlines' cargo subsidiary—to be loaded onto a lorry to transport it to Kuala Lumpur International Airport and onwards by air to Beijing. :104 At the Penang Cargo Complex, the consignment was inspected by MASkargo employees and Malaysian customs officials, but did not go through a security screening before the truck was sealed for transfer to the airport. The consignment did not go through any additional inspections at Kuala Lumpur International Airport before it was loaded onto Flight 370.:104 Because the batteries were packaged in accordance with IATA guidelines,[m] they were not regulated as dangerous goods. :106 Lithium-ion batteries can cause intense fires if they overheat and ignite, which has led to strict regulations on their transport aboard aircraft. A fire fuelled by lithium-ion batteries caused the crash of UPS Airlines Flight 6, and lithium-ion batteries are suspected to have caused a fire which resulted in the crash of Asiana Airlines Flight 991; both were cargo aircraft. Some airlines have stopped carrying bulk shipments of lithium-ion batteries on passenger aircraft, citing safety concerns. A 4,566 kg (10,066 lb) consignment of mangosteens was aboard Flight 370.:107 The mangosteens were loaded into four ULDs at Kuala Lumpur International Airport, and inspected by officials from Malaysia's Federal Agriculture Marketing Authority before being loaded onto Flight 370.:108 According to the head of Malaysian police, Khalid Abu Bakar, the people who handled the mangosteens and the Chinese importers were questioned to rule out sabotage. Public communication from Malaysian officials regarding the loss of the flight was initially beset with confusion. [n] The Malaysian government and the airline released imprecise, incomplete, and sometimes inaccurate information, with civilian officials sometimes contradicting military leaders. Malaysian officials were criticised for such persistent release of contradictory information, most notably regarding the last location and time of contact with the aircraft. Malaysia's acting Transport Minister Hishammuddin Hussein, who was also the country's Defence Minister (until May 2018), denied the existence of problems between the participating countries, but academics explained that because of regional conflicts, there were genuine trust issues involved in co-operation and sharing intelligence, and that these were hampering the search. International relations experts suggested that entrenched rivalries over sovereignty, security, intelligence, and national interests made meaningful multilateral co-operation very difficult. A Chinese academic made the observation that the parties were searching independently; thus it was not a multilateral search effort. The Guardian noted the Vietnamese permission given for Chinese aircraft to overfly its airspace as a positive sign of co-operation. Vietnam temporarily scaled back its search operations after the country's Deputy Transport Minister cited a lack of communication from Malaysian officials despite requests for more information. China, through the official Xinhua News Agency, urged the Malaysian government to take charge and conduct the operation with greater transparency, a point echoed by the Chinese Foreign Ministry days later. Malaysia had initially declined to release raw data from its military radar, deeming the information "too sensitive", but later acceded. Defence experts suggested that giving others access to radar information could be sensitive on a military level, for example: "The rate at which they can take the picture can also reveal how good the radar system is." One suggested that some countries could already have had radar data on the aircraft, but were reluctant to share any information that could potentially reveal their defence capabilities and compromise their own security. Similarly, submarines patrolling the South China Sea might have information in the event of a water impact, and sharing such information could reveal their locations and listening capabilities. Criticism was also levelled at the delay of the search efforts. On 11 March 2014, three days after the aircraft disappeared, British satellite company Inmarsat (or its partner, SITA) had provided officials with data suggesting that the aircraft was nowhere near the areas in the Gulf of Thailand and the South China Sea being searched at the time, and that it may have diverted its course through a southern or northern corridor. This information was not acknowledged publicly until it was released by the Malaysian Prime Minister in a press conference on 15 March. Explaining why information about satellite signals had not been made available earlier, Malaysia Airlines stated that the raw satellite signals needed to be verified and analysed "so that their significance could be properly understood" before it could publicly confirm their existence. Acting Transport Minister Hishammuddin claimed that Malaysian and US investigators had immediately discussed the Inmarsat data upon receiving them on 12 March, and that they had agreed to send the data to the US for further processing on two separate occasions. Data analysis was completed on 14 March, by which time the AAIB had independently arrived at the same conclusion. In June 2014, relatives of passengers on Flight 370 began a crowdfunding campaign on Indiegogo to raise US$100,000—with an ultimate goal of raising US$5 million—as a reward to encourage anyone with knowledge of the location of Flight 370, or the cause of its disappearance, to reveal what they knew. The campaign, which ended on 8 August 2014, raised US$100,516 from 1007 contributors. A month after the disappearance, Malaysia Airlines' chief executive Ahmad Jauhari Yahya acknowledged that ticket sales had declined but failed to provide specific details. This may have partially resulted from the suspension of the airline's advertising campaigns following the disappearance. Ahmad stated in an interview with the Wall Street Journal that the airline's "primary focus...is that we do take care of the families in terms of their emotional needs and also their financial needs. It is important that we provide answers for them. It is important that the world has answers, as well." In further remarks, Ahmad said he was not sure when the airline could start repairing its image, but that the airline was adequately insured to cover the financial loss stemming from Flight 370's disappearance. In China, where the majority of passengers were from, bookings on Malaysia Airlines were down 60% in March. Malaysia Airlines retired the Flight 370 (MH370) flight number and replaced it with Flight 318 (MH318) beginning 14 March. This follows a common practice among airlines to rename flights following notorious accidents. The flight—Malaysia Airline's second daily flight to Beijing—was later suspended beginning 2 May; according to insiders, this was due to lack of demand. Malaysia Airlines was given US$110 million from insurers in March 2014 to cover initial payments to passengers' families and the search effort. In May, remarks from lead reinsurer of the flight, Allianz, indicated the insured market loss on Flight 370, including the search, was about US$350 million. At the time of Flight 370's disappearance, Malaysia Airlines was struggling to cut costs to compete with a wave of new, low-cost carriers in the region. In the previous three years, Malaysia Airlines had booked losses of: RM1.17 billion (US$356 million) in 2013, RM433 million in 2012, and RM2.5 billion in 2011. Malaysia Airlines lost RM443.4 million (US$137.4 million) in the first quarter of 2014 (January–March). The second quarter—the first full quarter in the aftermath of Flight 370's disappearance—saw a loss of RM307.04 million (US$97.6 million), which represented a 75-percent increase over losses from the second quarter of 2013. Industry analysts expected Malaysia Airlines to lose further market share and face a challenging environment to stand out from competitors while addressing its financial plight. The company's stock, down as much as 20 percent following the disappearance of Flight 370, had fallen 80% over the previous five years, which contrasted with a rise in the Malaysian stock market of about 80% over the same period. Many analysts and the media suggested that Malaysia Airlines would need to rebrand and repair its image and/or require government assistance to return to profitability. The loss of Flight 17 in July greatly exacerbated Malaysia Airline's financial problems. The combined effect on consumer confidence of the loss of Flight 370 and Flight 17, and the airline's poor financial performance, led Khazanah Nasional—the majority shareholder (69.37%) and a Malaysian state-run investment arm—to announce on 8 August its plan to purchase the remainder of the airline, thereby renationalising it. Malaysia Airlines renationalized on 1 September 2015. Lack of evidence in determining the cause of Flight 370's disappearance, as well as the absence of any physical confirmation that the airplane crashed, raises many issues regarding responsibility for the accident and the payments made by insurance agencies. Under the Montreal Convention, it is the carrier's responsibility to prove lack of fault in an accident and each passenger's next-of-kin are automatically entitled, regardless of fault, to a payment of approximately US$175,000[o] from the airline's insurance company—amounting to a total of almost US$40 million for the 227 passengers on board. Malaysia Airlines was also vulnerable to civil action from passengers' families. Compensation awarded during civil cases (or settlements reached out-of-court) was likely to vary widely among passengers, based on the country where the proceedings were to take place. An American court could be expected to award upwards of US$8–10 million, while Chinese courts would be likely to award a small fraction of that amount. Despite the announcement that the flight ended in the southern Indian Ocean, it was not until 29 January 2015 that the Malaysian government officially declared Flight 370 an accident with no survivors, a move that would allow compensation claims to be made. The first civil case relating to the disappearance was filed in October 2014—even before Flight 370 had been declared an accident—on behalf of two Malaysian boys whose father was a passenger;[p] they were claiming for negligence in failing to contact the aircraft soon after it was lost and for breach of contract for failing to bring the passenger to his destination. Additional civil proceedings against Malaysia Airlines were filed in China and Malaysia. Soon after the disappearance of Flight 370, Malaysia Airlines offered ex gratia condolence payments to families of the passengers. In China, the families were offered ¥31,000 (approx. US$5,000) "comfort money", but some rejected the offer. It was also reported that Malaysian relatives received only $2,000. 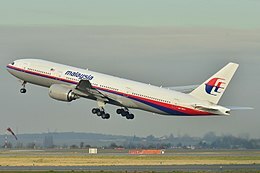 In June 2014, Malaysia's deputy Foreign Minister Hamzah Zainuddin said that families of seven passengers received $50,000 advance compensation from Malaysia Airlines, but that full payout would come after the aircraft was found, or officially declared lost (which later occurred in January 2015). Air force experts raised questions and the Malaysian opposition leveled criticisms about the state of Malaysia's air force and radar capabilities. Many criticised the failure of the Royal Malaysian Air Force to identify and respond to an unidentified aircraft (later determined to be Flight 370) flying through Malaysian airspace. The Malaysian military became aware of the unidentified aircraft only after reviewing radar recordings several hours after the flight's disappearance. The failure to recognise and react to the unidentified aircraft was a security breach, and was also a missed opportunity to intercept Flight 370 and prevent the time-consuming and expensive search operation. The Malaysian Prime Minister, Najib Razak, responded to criticism of his government in an opinion piece published in The Wall Street Journal in which he acknowledged mistakes had been made, and said time would show that Malaysia had done its best, had helped co-ordinate the search, and would continue to support. Najib went on to emphasise the need for the aviation industry to "not only learn the lessons of MH370 but implement them," saying in closing that "the world learned from Air France Flight 447 but didn't act. The same mistake must not be made again." Opposition leader Anwar Ibrahim criticised the Malaysian government regarding its response to Flight 370's disappearance and the military's response when Flight 370 turned back over the Malay Peninsula; he called for an international committee to take charge of the investigation "to save the image of the country and to save the country." Malaysian authorities have accused Anwar—who was jailed on contentious charges the day before Flight 370 disappeared—of politicising the crisis. Flight 370's captain was a supporter of Anwar and the two knew each other. Questioned about why Malaysia did not scramble fighter jets to intercept the aircraft as it tracked back across the Malay Peninsula, Defence Minister Hishammuddin Hussein noted that it was deemed a commercial aircraft and was not hostile, remarking: "If you're not going to shoot it down, what's the point of sending [a fighter jet] up?" The response to the crisis and lack of transparency in the response brought attention to the state of media in Malaysia. After decades of having tight control of media, during which government officials were accustomed to passing over issues without scrutiny or accountability, Malaysia was suddenly thrust to the forefront of global media and unable to adjust to demands for transparency. On the second anniversary of the disappearance, 8 March 2016, Najib said that he was hopeful that the missing Flight 370 would be found. The Malaysian Parliament observed a moment of silence to mark the anniversary. Najib said that the search had been "the most challenging in aviation history", but that he remained committed to completing it. Chinese Deputy Foreign Minister Xie Hangsheng reacted sceptically to the conclusion by the Malaysian government that the aircraft had gone down with no survivors, demanding on 24 March 2014 "all the relevant information and evidence about the satellite data analysis", and said that the Malaysian government must "finish all the work including search and rescue." The following day, Chinese president Xi Jinping sent a special envoy to Kuala Lumpur to consult with the Malaysian government over the missing aircraft. In the days following the disappearance of Flight 370, relatives of those onboard became increasingly frustrated at the lack of news. On 25 March 2014, around two hundred family members of the Chinese passengers protested outside the Malaysian embassy in Beijing. Relatives who had arrived in Kuala Lumpur after the announcement continued with their protest, accusing Malaysia of hiding the truth and harbouring a murderer. They also wanted an apology from the Malaysian government for its poor initial handling of the disaster and its "premature" conclusion of total loss, drawn without any physical evidence. An op-ed for China Daily said that Malaysia was not wholly to be blamed for its poor handling of such a "bizarre" and "unprecedented crisis," and appealed to the Chinese relatives not to allow emotions to prevail over evidence and rationality. The Chinese ambassador to Malaysia defended the Malaysian government's response, stating that the "radical and irresponsible opinions [of the relatives] do not represent the views of Chinese people and the Chinese government". The ambassador also strongly criticised Western media for having "published false news, stoked conflict and even spread rumours" to the detriment of relatives and of Sino–Malaysian relations. On the other hand, a US Department of Defense official criticised China for what he perceived as providing apparently false leads that detracted from the search effort and wasted time and resources. On 7 March 2016, the day before the second anniversary of the disappearance, twelve Chinese families with relatives on board the missing aircraft filed a lawsuit in Beijing, one day before the deadline for pursuing litigation against the carrier. In Kuala Lumpur, lawyer Ganesan Nethi reported that he had filed a joint lawsuit on behalf of the families of 32 passengers on 3 March 2016, explaining that most were Chinese, along with an American and a few Indians. Some Chinese boycotted all things Malaysian, including holidays and singers, in protest of Malaysia's handling of the Flight 370 investigation. Bookings on Malaysia Airlines from China, where the majority of passengers were from, were down 60% in March. In late March, several major Chinese ticketing agencies—eLong, LY.com, Qunar and Mango—discontinued the sale of airline tickets to Malaysia and several large Chinese travel agencies reported a 50-percent drop in tourists compared to the same period the year before. China was the third largest source of visitors to Malaysia prior to Flight 370's disappearance, accounting for 1.79 million tourists in 2013. One market analyst predicted a 20–40% drop in Chinese tourists to Malaysia, resulting in a loss of 4–8 billion yuan (RM2.1–4.2 billion; US$0.65–1.3 billion). The boycotts were largely led or supported by celebrities. Film star Chen Kun posted a message to Weibo—where he had 70 million followers—stating that he would be boycotting Malaysia until its government told the truth. The post was shared over 70,000 times and drew over 30,000 comments. Over 337,000 people retweeted a tweet from TV host Meng Fei, that said he would join the boycott. China and Malaysia had previously nominated 2014 to be the "Malaysia–China Friendship Year" to celebrate 40 years of diplomatic relations between the two countries. The fact that, in a digitally-connected world, a modern aircraft could disappear was met with surprise and disbelief by the public. While changes in the aviation industry often take years to be implemented, airlines and air transport authorities responded swiftly to take action on several measures to reduce the likelihood of a similar incident. The International Air Transport Association (IATA)—an industry trade organisation representing over 240 airlines (representing 84% of global air traffic)—and the International Civil Aviation Organization (ICAO)—the United Nations' civil aviation body—began working on implementing new measures to track aircraft in flight in real time. The IATA created a task force (which included several outside stakeholders) to define a minimal set of requirements that any tracking system must meet, allowing airlines to decide the best solution to track their aircraft. The IATA's task force planned to come up with several short-, medium-, and long-term solutions to ensure that information is provided in a timely manner to support search, rescue, and recovery activities in the wake of an aircraft accident. The task force was expected to provide a report to the ICAO on 30 September 2014, but on that day said that the report would be delayed, citing the need for further clarification on some issues. In December 2014, the IATA task force recommended that, within 12 months, airlines track commercial aircraft in no longer than 15-minute intervals. The IATA itself did not support the deadline, which it believed could not be met by all airlines, but the proposed standard had the support of the ICAO. Although the ICAO can set standards, it has no legal authority and such standards must be adopted by member states. In 2016, the ICAO adopted a standard that, by November 2018, all aircraft over open ocean report their position every 15 minutes. In March, the ICAO approved an amendment to the Chicago Convention requiring new aircraft manufactured after 1 January 2021 to have autonomous tracking devices which could send location information at least once per minute in distress circumstances. There was a call for automated transponders after the 11 September 2001 terrorist attacks; no changes were made, as aviation experts preferred flexible control, in case of malfunctions or electrical emergencies. In the wake of Flight 370, the air transport industry was still resistant to the installation of automated transponders, which would likely entail significant costs. Pilots also criticised changes of this kind, insisting on the need to cut power to equipment in the event of a fire. Nonetheless, new types of tamper-proof circuit breakers were being considered. 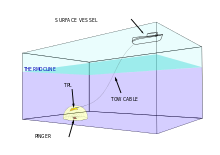 Detection of the acoustic signal from the ULBs must be made below the thermocline and within a maximum range, under nominal conditions, of 2,000–3,000 m (6,600–9,800 ft). With a ULB battery life of 30–40 days, searching for the important flight recorders is very difficult without precise coordinates of the location at which the aircraft entered the water. The intensive and urgent search for the flight recorders in early April 2014, due to the 30-day battery life of the ULBs (or "pingers") attached to them, drew attention to their inherent limitations. [q] The maximum distance from the ULBs at which the signal can be detected is normally 2,000–3,000 m (6,600–9,800 ft), or 4,500 m (14,800 ft) under favourable conditions. :11 Even if the flight recorders are located, the cockpit voice recorder memory has the capacity to store only two hours of data, continuously recording over the oldest data. This storage capacity complies with regulations, which take account of the fact that it is usually only the data recordings from the last section of a flight that are needed to determine the cause of an accident. However, the events that led to Flight 370 diverting from its course, before disappearing, took place more than two hours before the flight ended. Given these shortcomings, and the importance of the data stored on flight recorders, Flight 370 has brought to attention new technologies that enable data streaming to the ground. A call to increase the battery life of ULBs was made following the unsuccessful initial search in 2009 for the flight recorders on Air France Flight 447, which were not located until 2011. A formal recommendation that the ULB design be upgraded to offer a longer battery life, or to make the recorders ejectable, had been included in the final report of the board of inquiry into the loss of South African Airways Flight 295 over the Indian Ocean in 1987, but it was not until 2014 that the ICAO made such a recommendation, with implementation required by 2018. The European Aviation Safety Agency (EASA) has issued new regulations that require the transmitting time of ULBs fitted to aircraft flight recorders to be increased from 30 to 90 days, to be implemented by 1 January 2020. The agency has also proposed that a new underwater locator beacon with a greater range of transmission should be fitted to aircraft that fly over oceans. In June 2015, Dukane, a manufacturer of underwater locator beacons, began selling beacons with a 90-day battery life. In March 2016, the ICAO adopted several amendments to the Chicago Convention in order to address issues raised by the disappearance of Flight 370. For aircraft manufactured after 2020, cockpit voice recorders will be required to record at least 25 hours of data, to ensure that all phases of a flight are recorded. Aircraft designs approved after 2020 will need to incorporate a means of recovering the flight recorders, or the information contained on them, before the recorders sink below the water. This provision is performance-based so that it can be accomplished by different techniques, such as streaming flight recorder data from a stricken aircraft, or using flight recorders that eject from the aircraft and float on the surface of the water. The new regulations do not require modifications to be made to existing aircraft. In January 2015, the US National Transportation Safety Board cited Flight 370 and Air France Flight 447 when it issued eight safety recommendations[r] related to locating aircraft wreckage in remote or underwater locations; and repeated recommendations for a crash-protected cockpit image recorder and tamper-resistant flight recorders and transponders. The disappearance of Malaysia Airlines Flight 370 has been described as "one of the biggest mysteries in modern aviation history". Several documentaries have been produced about the flight. The Smithsonian Channel aired a one-hour documentary on 6 April 2014, titled Malaysia 370: The Plane That Vanished, and the Discovery Channel broadcast a one-hour documentary about Flight 370 on 16 April 2014, titled Flight 370: The Missing Links. On 17 June 2014, an episode of the television documentary series Horizon, titled "Where is Flight MH370?" was broadcast on BBC Two. The programme, narrated by Amanda Drew, documents how the aircraft disappeared, what experts believe to have happened to it, and how the search has unfolded. It also examines new technologies, such as flight recorder streaming and automatic dependent surveillance – broadcast (ADS-B), which may help prevent similar disappearances in the future. The programme concludes by noting that Ocean Shield had spent two months searching 850 km2 (330 sq mi) of ocean, but that it had searched far to the north of the Inmarsat "hotspot" on the final arc, at approximately 28 degrees south, where the aircraft was most likely to have crashed. On 8 October 2014, a modified version of the Horizon programme was broadcast in the US by PBS as an episode of NOVΛ, titled "Why Planes Vanish", with a different narrator. The first fictional account of the mystery was Scott Maka's MH370: A Novella, which was published three months after the aircraft's disappearance. The aviation disaster documentary television series Mayday (also known as Air Crash Investigation or Air Emergency) produced an episode on the disaster, titled "Malaysia 370: What Happened?" The episode aired in the UK on 8 March 2015, the first anniversary of Flight 370's disappearance. In August 2018, the television series Drain the Oceans, which airs on the National Geographic channel, highlighted the disaster, the methods used in the search, and the potential discoveries. Panoply is making a podcast story loosely based on the disappearance of MH370, called "Passenger List", featuring the voice of Kelly Marie Tran as the lead character. Jeff Rake, creator of the NBC show Manifest, claimed that the show only made it to air because of the MH370 disappearance. This page is based on the Wikipedia article Malaysia Airlines Flight 370; it is used under the Creative Commons Attribution-ShareAlike 3.0 Unported License (CC-BY-SA). You may redistribute it, verbatim or modified, providing that you comply with the terms of the CC-BY-SA.